As a violent pacifist, I sympathise with Linda, and all of us, really, we, the many pawns of the universe, all of us made from atoms billions of years old already. You’d think they would have acquired enough wisdom by now to have nothing to do with war and mayhem. Hmmph – evolution, so protonically, neutronically, electronically slow. 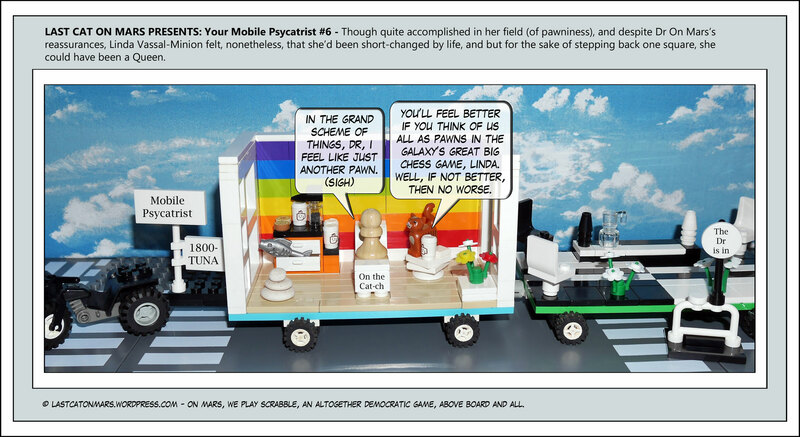 This entry was posted in Variety Show and tagged cartoon, chess, comic, Dr on Mars, lego, minifigure, mobile psycatrist, pawn, psychiatrist, psychiatry on October 31, 2018 by Jay Verney.